A scenic 40 minute ferry ride from Vancouver, situated on the beautiful Sunshine Coast, Up The Creek Backpacker's B&B is 14km from the ferry terminal at Langdale. It is a charismatic, family-run cedar house nestled amongst many large cedar and fir trees, and is an easy 10-minute walk to the "Heart of Roberts Creek". Open Year Round including Christmas Day, the lodge includes a full country style kitchen with the chance to try out a wood cook stove, a large sun-deck with hammocks and barbeque, friendly common areas including a wood heated sunken lounge, a brightly lit sun-room, a games and music area, and a resource library and book swap. Tours and Packages — something for everyone in every season! 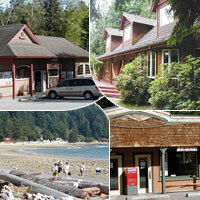 Moon Handbook British Columbia:: "The relaxed atmosphere is reason enough to rest your head here overnight. Throw in well priced beds, modern amenities such as a full kitchen and internet access, friendly owners and you'll want to stay longer." Borrow one of our free loaner bikes for a cruise around the village, play volleyball as the sun sets, try out the trampoline with its built in sprinkler hose, or just laze back on your bunk and listen to the sound of silence. Read more about the B&B. © 2016 Up The Creek B&B. No copying of images or content without written permission.